Our control hardware communicates on the Verizon 4G/LTE network. 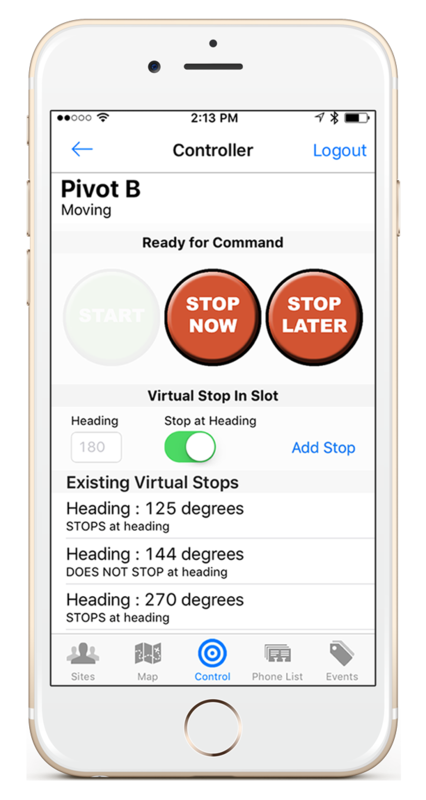 Shutdown your pivot remotely and schedule shutdown at certain positions in the field. Start your pivot from your computer or phone. Only available on electrically driven pivots. There is no hardware cost. When you sign up for our service, we provide the necessary hardware for the service you choose. It is fully warranted and covered during the terms of our subscription. Our equipment is easy to install and most of our customers choose to do it themselves.We provide all the necessary documentation you need. If you need any additional help we are here to support you and are happy to connect you with a service professional in your area. The Protect and Monitor packages typically take less than 10 minutes to install. The Control package can usually be installed in less than an hour. Will this work on a T-L pivot? Yes! In order to received accurate GPS coordinates for monitoring, your T-L pivot will need to have power at the end tower (also known as “Point-Control”). 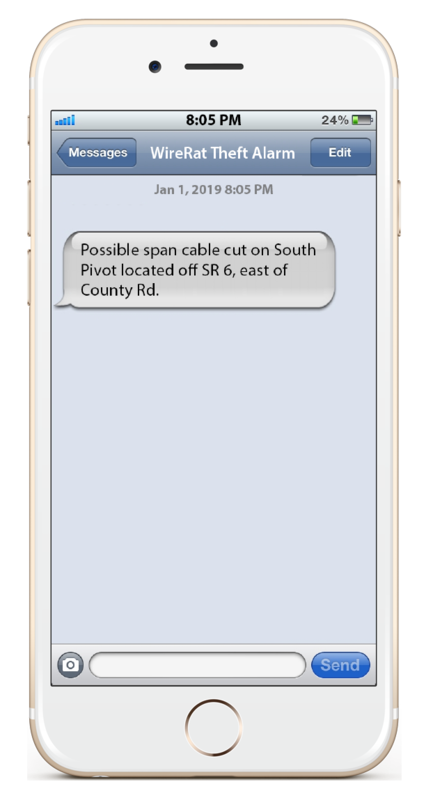 For manual T-L pivots, the Monitoring hardware can still be connected at the center point or engine to inform you on the run status of your pivot. We understand that your business changes. You may cancel your subscription through the mobile app or by calling us. When choosing to not renew, the hardware is required to be returned within 30 days of cancellation. How soon do I get my hardware once I sign up? Hardware usually ships within 1-3 business days from ordering. Can you change direction with the Control package? No. At this point our Control package will only start and stop the pivot. If the pivot was running in Reverse when you last ran it, the pivot will start up in reverse mode. Can I remotely start an engine driven pivot? No. We are not able to remotely start an engine driven pivot? What network does your hardware work on? Will it work with my mobile network? Our devices work on the Satellite network to monitor your pivot, eliminating any cellular coverage concerns. Additionally, our Control package utilizes the Verizon 4G LTE network for two-way communication. Our devices will keep you up to date and allow you to communicate with them regardless which mobile provider you use. Span cable theft detection for center pivots without that does not require power. Receive voice call, text, or email alerts for up to 10 contacts immediately at the time of span cut. Magnetically mounts on the end tower of the pivot to monitor a disruption in the span of the pivot. Installation is done by most in less than 30 mins. It is easy to install the CircleScout® Protect hardware. The satellite box is magnetically mounted on the end tower of the pivot with four wires to connect; forward, reverse, ground,and neutral. It is quick - most install it in 30 minutes or less. Need help? You can call or chat with us at no additional charge! Click below to see detailed wiring for your pivot. Universal satellite remote monitoring for center pivot with GPS and run status alerts. GPS Monitoring (position and direction). Virtual heading alerts (i.e notify me when my pivot is pointing East). Receive voice call, text, or email alerts for up to 10 contacts when the pivot starts and stops. It is easy to install the CircleScout® Monitor hardware. The satellite box is magnetically mounted on the end tower of the pivot with four wires to connect; forward, reverse, ground,and neutral. It is quick - most install it in 30 minutes or less. Need help? You can call or chat with us at no additional charge! Remote start and stop functionality using our mobile and web apps. Ability to set stop-in-slot locations to stop the pivot at predetermined headings in your field. GPS Monitoring of run status, position, and direction. Text, voice, email, and push notifications. Optional WireRat® Copper Wire Theft Alarm. Easy installation designed for the do-it-yourself farmer. Customer support available via chat, text, phone, and online. Wiring instructions included with hardware. 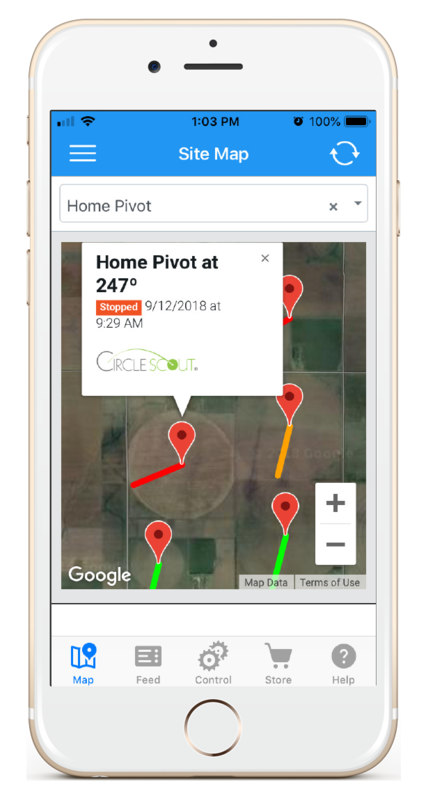 Use the CircleScout® mobile app set up and configure each pivot.